Get a taste of an entirely new world when you experience this Firey Magic Ayahuasca kit. You don’t have to be gathered around the fire in the deep jungle of Brazil to experience the magic of this concoction; this kit can be delivered right to your mailbox with ease. This is a powerful substance meant for spiritual people to transcend this world and experience other worlds. Step Into a New World. Users of Ayahuasca have a completely different experience that’s nothing like shrooms or magic truffles. Rather than hallucinating as if the visions aren’t real, Ayahuasca allows you to perceive vision as if they are real (and maybe they are real!). Have Your Outlook Change. Often times we get stuck in routines from work, school, stress and family life. It’s nice to break free and try new things. The wisdom from your trip will change your mind in many ways. Experience True Magic. Magic isn’t just about card tricks and pulling bunnies from hats. This kit will allow you to see visions and enter worlds that are truly magical. Powerful, Carefully Dried Leaves. The leave of this kit are dried in the shade to maintain potency and maximize freshness. Best of all, they’re whole and not crumbly. Potent and High Quality. We only offer the highest quality ingredients that are tested and proven to give great trips. Hallucinating and getting high doesn't necessarily have to be an overly-stimulating, fun experience. This kit is for true spiritual people and individuals looking for answers to their deepest question. Discover the beauty of this Fiery Magic kit; order now. Psychotria Viridis dryed leaves. Our fresh leaves come from the most powerful Brazilian strain “ Rainha Preta “ or “ Black Psychotria”. They are carefully dried in the shade to the optimum condition, so it`s always smeling very fresh and without crumbly leaves. Syrian rue (Peganum harmala).Contains the Harmaline alkoloid. Their properties derive from MAO-inhibiting beta-carboline alkaloids, making it usefl as an ayahuasca admixture. Grind or pulverize the ingredients and put them in a pan. Add 150 ml of distilled of filtered water. Add 50 ml of lemon juice, or vitamine C tablet. Simmer and stir the liquid for 15 to 30 minutes on the lowest fire on your stove. You can now drink it! I just ordered this healing tea kit from this site and looking forward to divine healing . I mainly want to continue to make spiritual connection, to awaken my 6 senses again. Namaste. 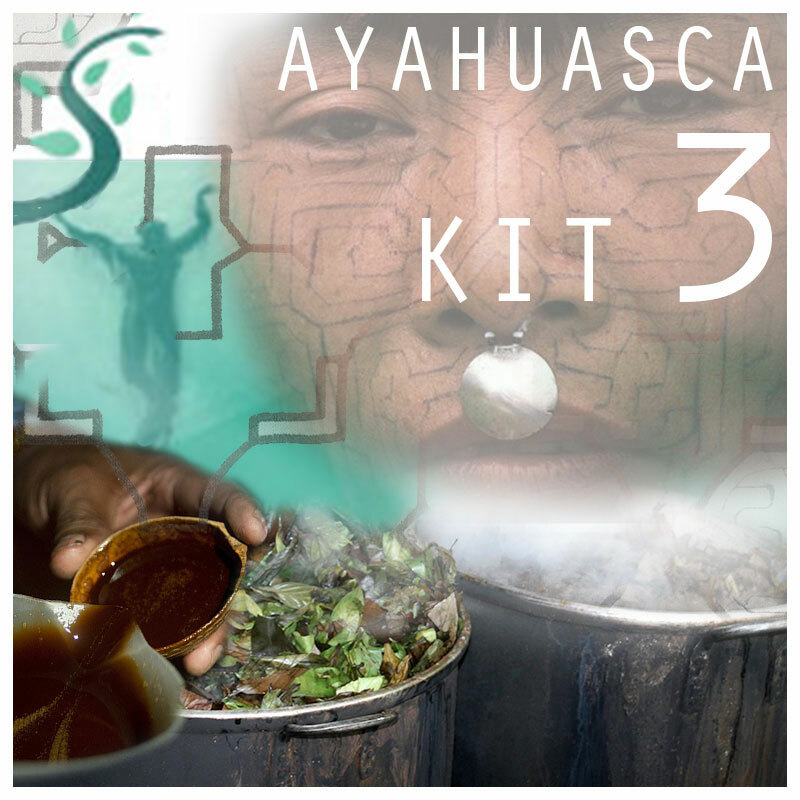 Share your experience about Ayahuasca Kit 3 with other customers. Submit your tips or thought on this product, be detailed and specific.